After speaking at a gathering of manufacturers to tout the U.S. economy, he held a roundtable with Governor Ducey and spent time at the Drug Enforcement Agency's Phoenix headquarters. 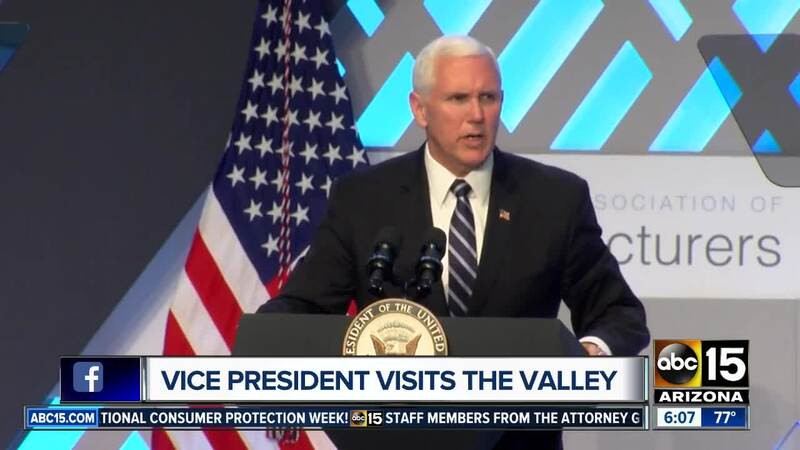 PHOENIX — Vice President Mike Pence made several stops in a visit to the Valley on Tuesday. Pence landed on Air Force Two at Phoenix Sky Harbor International Airport just after 11 a.m.
Vice President Mike Pence called on the Senate Tuesday not to reject President Donald Trump's emergency declaration freeing up money to build a wall on the southern border. "Any vote against the president's national emergency declaration is a vote against border security," Pence said after touring a Drug Enforcement Administration facility in Phoenix. The Democratic-led House voted recently to upend Trump's emergency declaration. Senate Majority Leader Mitch McConnell acknowledged Monday that there are enough votes in the Senate to follow suit, though he said Trump will veto it and his veto will likely be sustained. Pence singled out Arizona's senators, Republican Martha McSally and Democrat Kyrsten Sinema, who have not said whether they'll support the resolution opposing the emergency declaration. Both have said they don't want funding for the wall to come from construction planned for military installations in Arizona. "We call on every member of the Senate -- and your senators from here in Arizona -- to stand for border security, stand with President Trump, and uphold the president's call for a national emergency and additional resources to secure our border," Pence said. The vice president's comments echoed those he made earlier Tuesday at a meeting of the National Association of Manufacturers board of directors, where he urged business leaders to call on members of Congress to support the emergency declaration. Channeling themes that are likely to be featured prominently in Trump's 2020 re-election bid, Pence told the business leaders that the "Medicare for all" and "green new deal" policies championed by some Democrats are un-American. "I hope you'll see that choice before us," Pence said. "It is a debate between freedom and socialism. A debate between personal responsibility and government dependence." He also extolled the economy, touting growth in manufacturing jobs, and he urged executives to talk to their employees, "go meet the people in the cafeteria" and talk to them about the Trump administration's agenda of cutting taxes, rolling back regulations.